Currently no events are planned. 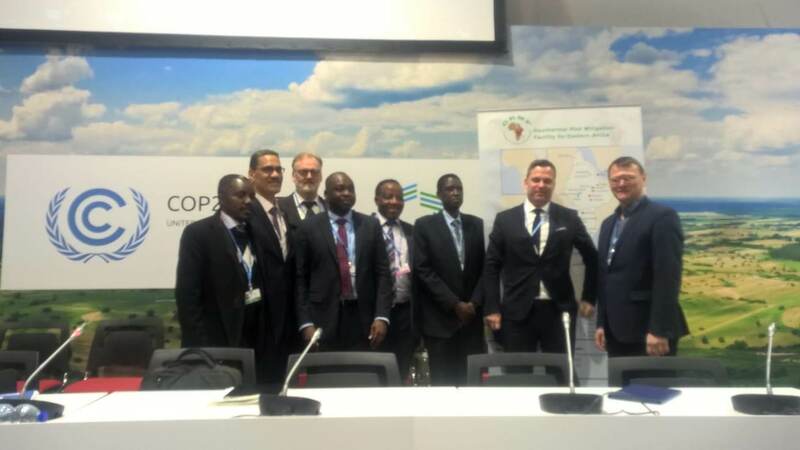 On the occasion of the United Nations Climate Change Conference – COP24, which was held in Katowice, Poland, from 2 to 14 December 2018, the African Union Commission (AUC) hosted a side event on GRMF at COP24 on 6 December 2018. The side event consisted of a presentation on GRMF: Summary of the Achievements and Status of GRMF to date, which was followed by a high level panel discussion on Geothermal Energy Development in East Africa, one of most important Renewable Energy resources in the region. The Discussion focused on the success achieved and the challenges facing the implementation and opportunities foreseen for the Geothermal Risk Mitigation Facility (GRMF), which is a facility for supporting public and private sector investment in geothermal development by mitigating early stage risks. The Regional Geothermal Coordination Unit (RGCU) of the AUC attended the 7th African Rift Geothermal Conference in Kigali (Rwanda) from 29 October to 4 November 2018. We took this opportunity to get in touch with the qualified developers via face-to-face meetings to discuss with them the status of their project, current challenges, and planned activities for it. During the conference, the RGCU also gave a presentation about the development of the programme, and met the geothermal community at the ARGeo-C7 for further discussions about the sector in Eastern Africa. On 13 and 14 June 2018, the African Union Commission (AUC) and German Federal Institute for Geosciences and Natural Resources (BGR) organized a 2 Day Short Course on the “African Union Code of Practice for Geothermal Drilling”. All files can be downloaded here in one single ZIP file. Please find here the related press release. More details of the workshop can be found under “News” . Addis Ababa, Ethiopia, 5 April 2018: The Department of Infrastructure and Energy of the African Union organized the obligatory pre-bidding workshop for all AR 5 applicants that have successfully passed the pre-qualification stage. The workshop took place on 26 and 27 March 2018 at the AUC HQ in Addis Ababa, Ethiopia. It included different sessions to inform the pre-qualified developers about the application and evaluation stage, the GRMF Procurement Manual, the environmental and social (E&S) requirements, specific aspects of the surface study and drilling programme applications, as well as the AWC Guidelines. Please click here to download all presentations in one single badge as ZIP file. The second part of the workshop was dedicated to face-to-face meeting with all pre-qualified developers, in order to discuss individually the EoI feedback letters, and to give further guidance on the Request for Application (RfA). Participants of the workshop included representatives of the AUC, the Technical Consultant (TC) team, and public and private developers from Djibouti, Ethiopia, Kenya, Rwanda, Tanzania, and Uganda. Please find below the presentations of the GRMF Workshop on 10 October 2017 as PDFs. All presentations also can be downloaded here in one single badge as a ZIP file. Addis Ababa, Ethiopia, 01 December 2016:The GRMF would like to inform you about a Geothermal Database Workshop that was held directly after the GRMF 4th AR pre-bidding workshop at the AUC HQ in Addis Ababa on 01 November 2016. The main objective of GRMF Database Promotion workshop was to promote the necessity of country databases for geothermal energy management. Country and regional databases are an important part of managing geothermal resources. It gives a basis for estimates of the geothermal potential and when updated regularly it can be a basis for monitoring of the utilization of the resource. The countries themselves should maintain responsibility for monitoring geothermal projects in their country, for managing their geothermal resource, and thus to gather data from projects for monitoring purposes. It can be a costly and time consuming process to put up country regulations and policies governing a national geothermal database. Therefore, information regarding the process and its’ purpose along with information about active donors and information exchange between the EARS countries regarding successes and challenges is key for best utilization of resources to facilitate development of county geothermal databases in EARS countries. The GRMF Database Promotion workshop promoted the necessity of country databases for geothermal energy management. Information and experience was exchanged on the status of geothermal databases and their possible support in the Eastern African Region, to enhance cooperation and coordination, and to identify potential synergies. The participants, mainly developers and representatives of funding organisations, discussed constraints to geothermal data dissemination. Developers stressed that the resource data is sensitive as it is their main asset at the first stages of development. For developers to give data to be integrated into country databases, the country would need to have adequate regulations in place. The GRMF pre-bidding workshop (mandatory participation for all applicants qualified to submit an RfA to the GRMF 4th application round) and related face-to-face meetings with applicants. Two workshops (organised in parallel) for providing explanation on GRMF Procurement regulations and the new GRMF ESIA regulations (mandatory participation for all GRMF beneficiaries from AR 1-AR 3 and for all eligible applicants intending to submit RfA for AR 4). Please do reserve these tentative dates for your participation in these workshops. An agenda for the workshop as well as invitation letters shall be provided in the week from 10 October 2016. All application documents for AR 4 RfA shall be availed to eligible entities on the webpage proximate to the pre-bidding workshop. Addis Ababa, Ethiopia, 17 June 2016: The AUC East Africa Donors’ Coordination meeting was held on Monday 13th June and Tuesday 14th June 2016. H.E Dr. Elham M. Ibrahim- Commissioner for Infrastructure and Energy, convened representatives of African Rift System (EARS) countries-, of donors and development partners as well as experts from public- and private beneficiaries for a two-day meeting to the African Union Headquarters. The focus of the two-day meeting was to encourage further geothermal investments (i.e. to improve access to equity or other funding sources) in line with the general aim of the AUC to play a catalytic role in establishing geothermal energy as a strategic option for expanding base-load power generation along the Eastern African Rift. at the AUC HQ in Addis Ababa, Ethiopia. The AUC Geothermal workshop – the so-called 1st East Africa Regional Geothermal Ministerial, will be held on 13 and 14 June 2016 (see below for draft agenda and concept note). The AR 4 kick-off event is expected to be held in the afternoon of the 14 June 2016 – the final timing will be communicated. Further, please indicate in case you need assistance for Visa on arrival to Ethiopia. The African Union Commission, Department of Infrastructure and Energy launched the Third Application Round for the Geothermal Risk Mitigation Facility (GRMF) on 30th October, 2014 as a side event during the Fifth African Rift Geothermal Conference (ARGeo-C5) in Arusha, Tanzania. The launch of the Third Application Round for the GRMF brought together more than eighty participants and among those who graced the launch were: The Minister of Energy for Comoros H.E. Mr. Abdou Nassur Madi, The Minister for Natural Resources, Energy and Mines of Malawi, H.E. Mr. Alipele Muluzi, development partners from KfW, DFID, African Development Bank, BGR, ICEIDA, Nordic Development Fund, UNEP developers from both public and private sector from Burundi, Comoros, Djibouti, DRC, Eritrea, Ethiopia, Kenya, Rwanda, Tanzania and Uganda. With the Launching event officially the pre-application phase of the GRMF 3rd Application Round commenced. Project developers are expected to submit their Expressions of Interest by 16:00H on 08th January 2015. The side event was considered a great success as it was well attended as well as due to the interesting questions, the rich discussions and responses provided by AUC experts and the team of the project’s Technical Consultant. As per the announcement of the 21st of August, the GRMF 3rd Application Round pre-application workshop will happen at the Arusha International Conference Center (AICC) in Arusha, Tanzania. The venue for this GRMF event will be the DULUTI Hall and it will take place for three hours from 10:00AM to 13:00PM local time on the 30th of October 2014. As this GRMF event will take place concurrently with the 5th African Rift Geothermal Conference (ARGeo-C5) conference, entering the conference facility will require valid tickets. For participants interested in the GRMF event, who might not be enlisted for the ARGeo-C5, please do provide us with your contact details so we can leave these with the security at the entrance to the conference center, which will enable you to participate at the GRMF event. We would further highly appreciate if project developers and other parties planning to participate in the GRMF event pre-announce their participation – while indicating that they also participate at the ARGeo-C5 (i.e. indicating that they do not need to be mentioned on the aforementioned list). Please do send the announcement and relevant information about your participation to the following email addresses: grmf@africa-union.org and grmf@roedl.com. The GRMF 3rd Application Round Expression of Interest phase will commence on 31st of October. The Geothermal Risk Mitigation Facility (GRMF) herewith kindly informs interested project developers and project financiers about the 3rd Application Round Pre-application Information workshop on financial support for geothermal projects in Eastern Africa. The pre-application information workshop will introduce the GRMF programme to potential applicants and will provide a comprehensive overview of the entire application procedure. The Request for Expression of Interest (EoI) and the related submission forms for EoI will be explained in detail. It is strongly recommended that potential applicants participate in the information workshop to ensure a mutual understanding of the requirements for the Application and thus are enabled to submit high quality EoI and Applications. The pre-application information workshop will be held in Arusha, Tanzania, on Thursday 30th October 2014 in form of a side event of the Fifth African Rift Geothermal Conference (ARGeo – C5). Detailed information and the registration procedures for the information workshop will be announced shortly. On May 26th 2014 – during the alongside the proceedings of the first day of the Geothermal Donor Collaboration meeting in Iceland, the AUC signed a drilling porgramme grant agreement with Reykjavik Geothermal ehf, making it the 4th grant agreement that becomes official from the GRMF 1st application round. Accoring to the plans of Reykjavik Geothermal, the development on the Corbetti geothermal prospect will initially contribute 20MWe to the Ethiopian power grid by the end of 2015. The Corbetti project is expected to be extended in a step-wise manner resulting in a final generation capacity of up to 300 MWe. The third Geothermal Donor Collaboration Meeting by the African Union Commission (AUC) and a Geothermal Workshop jointly hosted by the AUC and the Icelandic International Development Agency (ICEIDA) are taking place in Reykjavik, Iceland from the 26th to the 28th of May 2014. The workshop and lecture sessions – with focus on sharing information on the GRMF and on geothermal development in Eastern Africa, bring together more than 50 participants from the public and private sectors, as well as from numerous international development organisations. High ranking decision-makers of regulatory agencies from Djibouti, Comoros, Eritrea, Ethiopia, Kenya, Rwanda and Uganda convened for a workshop organised by the African Union Commission (AUC) through its’ Department of Infrastructure and Energy and the German Geological Survey (BGR). The workshop held in Naivasha, Kenya from 13th to 15th May had the objective to introduce existing and highly successful regulatory schemes for geothermal drilling now in place in the United States and New Zealand. Further, perspectives on drilling regulation from drilling supervisors who are responsible for on-site activities related to testing and safety for health, life and the environment were presented by lecturers from Canada, New Zealand and the United States. The Information Workshop will introduce the GRMF programme to potential Applicants and will provide a comprehensive overview of the whole Application procedure. Especially the Request for Expression of Interest (EoI) and the related submission form for EoI will be explained in detail. It is strongly recommended that potential Applicants participate in the information workshop to ensure a mutual understanding of the requirements for Application and thus a high quality of submitted EoI and Applications. The stakeholder meeting will allow key decision and policy makers to get insight into the potential resources, how that potential can be developed and how the GRMF programme will contribute towards meeting future energy goals.